Watson. Come at once if convenient. If inconvenient, come all the same. The Franklin House is located in the historic Murray Hill neighborhood of downtown Annapolis. Its a short distance from nearby cities and airports. Driving distance to Franklin House from the following airports can be more accurately determined using Google Maps on yours day of travel. The following times are a strong indicator without traffic delay. Explore the Naval Academy campus and go on a guided tour that provides an up-close glimpse of what life as a midshipman is really like. Make a stop at one or more of the campus' impressive attractions, including the midshipmen's Noon Formation, the Naval Academy Museum, the Armel-Leftwich Visitor Center, the Naval Academy Chapel, the crypt of naval hero John Paul Jones, and more. Attend a spirited sporting event at the Navy-Marine Corps Memorial Stadium or the Brigade Sports Complex; Navy Football, Lacrosse, and Hockey are some of the Academy's most popular spectator sports. To learn more about touring the Naval Academy, please visit their website. 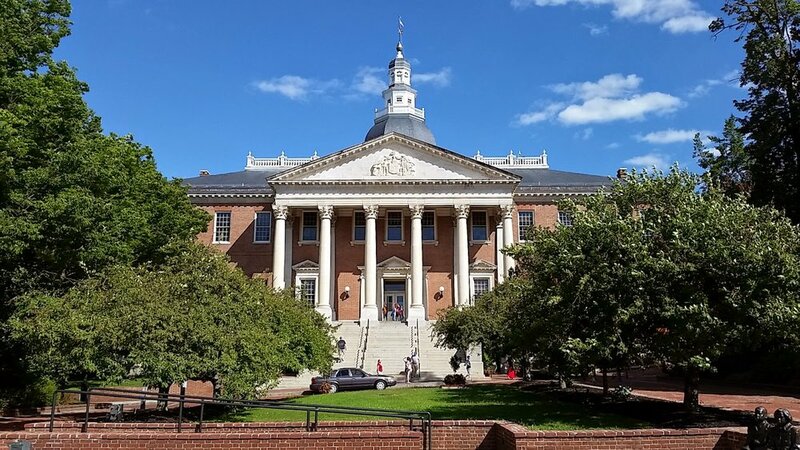 Built in 1772, it is the oldest state capitol still in continuous legislative use and the only state house ever to have served as the nation's capitol. The Continental Congress met in the Old Senate Chamber from November 26, 1783, to August 13, 1784. During that time, George Washington came before Congress to resign his commission as commander-in-chief of the Continental Army and the Treaty of Paris was ratified, marking the official end of the Revolutionary War. The State House is open to the public—to check the schedule or learn about self-guided tours, visit the website. Here is where you'll discover dozens of unique, locally-owned fashion boutiques and specialty gift shops tucked in between art galleries, pubs, restaurants and historic inns. City Dock is the historic heart of Annapolis, where it connects with the waters of the Chesapeake Bay. Watch the boats parade around the turning basin of "Ego Alley," shake out your sea legs aboard the tour boat, Harbor Queen or man the wheel of the graceful Schooner Woodwind. Simply relaxing at City Dock is a major reason why people visit Annapolis. City Dock also plays host to a handful of Annapolis’ biggest events such as the Annapolis Spring Sailboat Show in April – the largest in-water boat show in the world. Whether you’re after dining, boutique shopping, or simply looking to relax by the water, City Dock is the perfect place to spend your morning, afternoon, or evening in Annapolis. Colonial Tours of Annapolis offers a very popular tour - about 90 minutes in duration and all contained within less than 1 mile through the Historic District of Annapolis. Visit the State House, a colonial kitchen and dining room in a Georgian mansion, St. Anne's Parish, the Hammond-Harwood House, the Paca House, and more. Learn about the rivalry between the U.S. Naval Academy and St. John's College, and learn about everyday life in colonial Maryland. Tours leave the Annapolis Visitors Center throughout the year. Visit Colonial Tours of Annapolis for more information, or to book your tour. Surrounding this urban waterfront park, you’ll discover a number of family-friendly places to visit. The National Aquarium features more than 16,000 animals, from sharks to a giant sea turtle, while the Maryland Science Center’s highlights include two-story dinosaurs and interactive exhibits to keep the kids busy. The Port Discovery Children’s Museum features more activities for the little ones, and, a short ride away, the Maryland Zoo in Baltimore’s Druid Hill Park engages young and young at heart with the giraffe-feeding station and much more. And, if it’s the unexpected you seek, you’ll be talking about the oddities in Ripley’s Believe or Not! for weeks! THE NATIONAL MALL IN WASHINGTON, D.C. The National Mall, the great swath of green in the middle of our capital city and stretching from the foot of the Capitol building to the Potomac, is the premiere civic and symbolic space in our nation. National Mall and Memorial Parks protects the national mall and its iconic monuments and memorials and over 1,000 acres of greenspace in Washington, D.C. Come to visit the National Mall and stay to explore all that National Mall and Memorial Parks has to offer. Visit the Washington Monument, the Lincoln Memorial, the World War II Memorial, and so much more. Click here for more information.